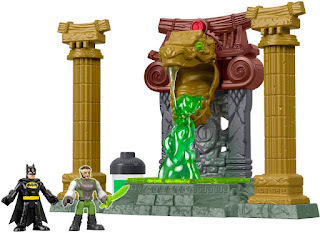 HURRY over to get this Fisher-Price Imaginext DC Super Friends, Batman Ooze Pit for ONLY $7.95 Shipped (Retail $25.99)! Young crimefighters can create all sorts of exciting battles with the DC Super Friends Batman Ooze Pit. Kids can help Ra's al Ghul tap into the power of the ooze and launch into battle with the Caped Crusader. Will this extra boost of fighting force help the Super-Villain defeat Batman ? That's for your young Super Hero to decide!